Distance is an extremely important aspect of becoming a better golfer. Perhaps you’ve seen this graphic put out by the folks at Trackman. 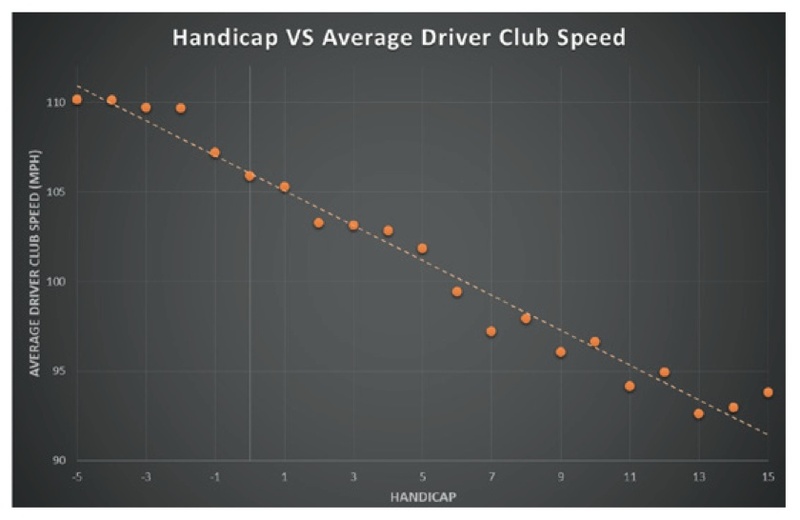 Notice that as golf handicaps go up, the average driver club head speed (and thus distance) goes down. Thus, one can deduce that more distance is a must in order to become a better player. On the PGA Tour, players that keep their cards generally run in the +4 to +6 handicap range. The PGA Tour average club head speed is about 113 mph with the low man usually being around 105 mph. So, if you were to extend the graphic from above out a little further, this fits right in with the PGA Tour, too. Further, I looked at the scoring averages of the top-20 players and the bottom-20 players on the PGA Tour. And if you compile the low rounds of the day shot during each tournament round, that averages out to be approximately a 63.3 scoring average with a 302.8 yards/drive driving distance. As you can see, even within the confines of PGA Tour-level golf, distance matters to scoring.